Aristotle (Greek: Ἀριστοτέλης, Aristotélēs) (384 BC – 322 BC) was a Greek philosopher, a student of Plato and teacher of Alexander the Great. His writings cover many subjects, including physics, metaphysics, poetry, theater, music, logic, rhetoric, linguistics, politics, government, ethics, biology, and zoology. Together with Plato and Socrates (Plato's teacher), Aristotle is one of the most important founding figures in Western philosophy. Aristotle's writings were the first to create a comprehensive system of Western philosophy, encompassing morality and aesthetics, logic and science, politics and metaphysics. Aristotle's views on the physical sciences profoundly shaped medieval scholarship, and their influence extended well into the Renaissance, although they were ultimately replaced by Newtonian physics. In the zoological sciences, some of his observations were confirmed to be accurate only in the 19th century. His works contain the earliest known formal study of logic, which was incorporated in the late 19th century into modern formal logic. In metaphysics, Aristotelianism had a profound influence on philosophical and theological thinking in the Islamic and Jewish traditions in the Middle Ages, and it continues to influence Christian theology, especially thescholastic tradition of the Catholic Church. His ethics, though always influential, gained renewed interest with the modern advent of virtue ethics. All aspects of Aristotle's philosophy continue to be the object of active academic study today. Though Aristotle wrote many elegant treatises and dialogues (Cicero described his literary style as "a river of gold"), it is thought that the majority of his writings are now lost and only about one-third of the original works have survived. Aristotle was born in Stageira, Chalcidice, in 384 BC, about 55 km (34 mi) east of modern-day Thessaloniki. His father Nicomachus was the personal physician to King Amyntas of Macedon. Aristotle was trained and educated as a member of the aristocracy. At about the age of eighteen, he went to Athens to continue his education at Plato's Academy. Aristotle remained at the academy for nearly twenty years before quitting Athens in 348/47 BC. The traditional story about his departure reports that he was disappointed with the direction the academy took after control passed to Plato's nephew Speusippus upon his death, although it is possible that he feared anti-Macedonian sentiments and left before Plato had died. He then traveled with Xenocrates to the court of his friend Hermias of Atarneus in Asia Minor. While in Asia, Aristotle traveled withTheophrastus to the island of Lesbos, where together they researched the botany and zoology of the island. Aristotle married Hermias's adoptive daughter (or niece) Pythias. She bore him a daughter, whom they named Pythias. Soon after Hermias' death, Aristotle was invited by Philip II of Macedon to become the tutor to his son Alexander the Great in 343 BC. Early Islamic portrayal of AristotleAristotle was appointed as the head of the royal academy of Macedon. During that time he gave lessons not only to Alexander, but also to two other future kings: Ptolemy andCassander. In his Politics, Aristotle states that only one thing could justify monarchy, and that was if the virtue of the king and his family were greater than the virtue of the rest of the citizens put together. Tactfully, he included the young prince and his father in that category. Aristotle encouraged Alexander toward eastern conquest, and his attitude towards Persia was unabashedly ethnocentric. In one famous example, he counsels Alexander to be 'a leader to the Greeks and a despot to the barbarians, to look after the former as after friends and relatives, and to deal with the latter as with beasts or plants'. Aristotle not only studied almost every subject possible at the time, but made significant contributions to most of them. In physical science, Aristotle studied anatomy, astronomy,embryology, geography, geology, meteorology, physics and zoology. In philosophy, he wrote on aesthetics, ethics, government, metaphysics, politics, economics, psychology, rhetoric and theology. He also studied education, foreign customs, literature and poetry. His combined works constitute a virtual encyclopedia of Greek knowledge. It has been suggested that Aristotle was probably the last person to know everything there was to be known in his own time. Near the end of Alexander's life, Alexander began to suspect plots against himself, and threatened Aristotle in letters. Aristotle had made no secret of his contempt for Alexander's pretense of divinity, and the king had executed Aristotle's grandnephew Callisthenes as a traitor. A widespread tradition in antiquity suspected Aristotle of playing a role in Alexander's death, but there is little evidence for this. Upon Alexander's death, anti-Macedonian sentiment in Athens once again flared. Eurymedon the hierophant denounced Aristotle for not holding the gods in honor. 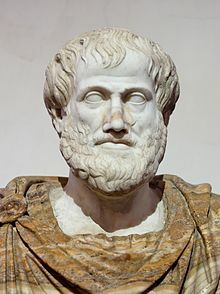 Aristotle fled the city to his mother's family estate in Chalcis, explaining, "I will not allow the Athenians to sin twice against philosophy," a reference to Athens's prior trial and execution of Socrates. He died in Euboea of natural causes within the year (in 322 BC). Aristotle named chief executor his student Antipater and left a will in which he asked to be buried next to his wife.